Solange Knowles released her album, A Seat at the Table, on September 30th, and Black women flooded the Internet with praises of the cultural masterpiece. Not only did the singer drop music specifically to empower Black women—but, she accompanied the music with stunning visuals that had us typing “#BlackGirlMagic” on nearly every social media platform. 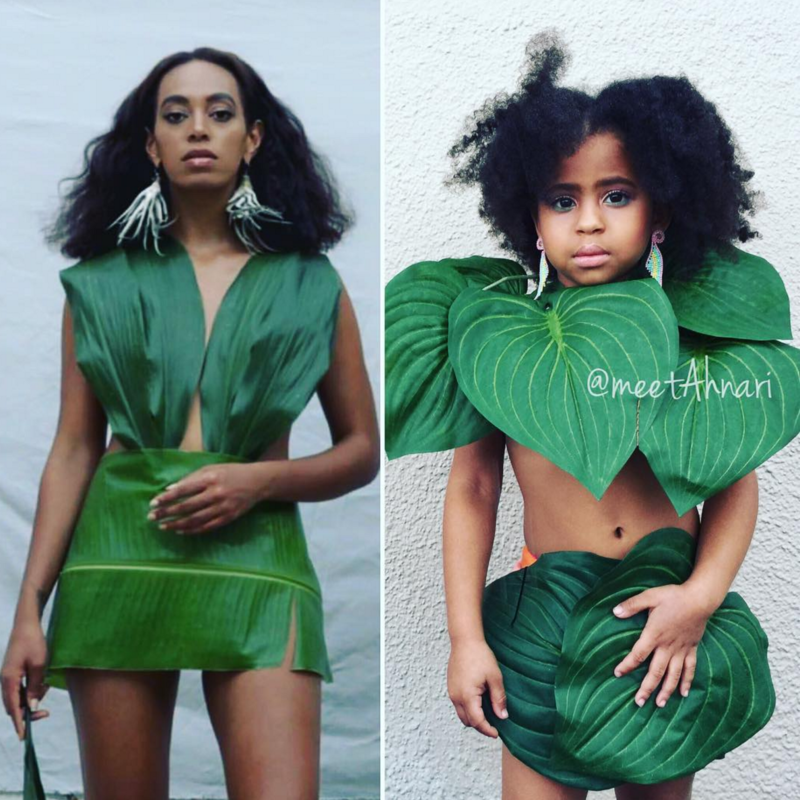 Young Ahnari Lemoine got in on the Solange frenzy with adorable recreations of Knowles’s album visuals. The photos—thought of by her mother, Michaela Lemoine, and Ahnari’s 12-year old sister, Aryonah—mimic Solange’s hair-pinned album cover, her green ensemble made of branches from the Cranes In The Sky video and her pink shroud look from the same video. Jamming with her daughters to an album dedicated to Black womanhood meant the world to Lemoine. “Music has always been our thing that we do together,” she says. “We listened to the entire album on shuffle. This is feel-good music for our family.” She even purchased the clean versions of the explicit songs on ASATT—specifically, F.U.B.U., Ahnari’s favorite album tune. And this is why Black women’s self-reflective art is so powerful. Sure, grown women are “Yasss-ing” to the album and retweeting the lyrics. And sure, Solange looked great on the cover. The lasting power, however, lies in what this visibility does for our brown babies. Ahnari isn’t the only child recreating Solange’s hair-clipped look, Buzzfeed reports. There’s four-month-old Clover Trotman in New York, two-year-old Jolie Dior from Virginia and seven-year-old Nilah Cheers from Illinois. All Black babies whose mothers were inspired by Solange Knowles’s visual and aural declaration of blackness. All Black children who will have their images contested countless times as they grow older, but have parents laying the foundation now for self-love and resiliency. Skype has launched its internet-structured customer beta towards the world, right after introducing it generally in the Usa and You.K. and video however, individuals need a connect-in installation).